Morgana is now recognized as a leading innovator in the development of finishing systems designed specifically to meet the needs of the rapidly growing digital print market. In just over thirty years Morgana Systems has grown to become the UK’s leading manufacturer and supplier of print finishing equipment. During the past ten years it has also established a global reputation as a leader and innovator in the development of systems specifically designed to finish digitally printed output. Breakthrough products like the AutoCreaser, the DigiFold and the DocuMaster all underline Morgana’s claim to be No. 1 in Digital Print Finishing. Morgana is the preferred finishing partner of all the leading manufacturers of digital print engines. We provide the equipment and service back-up that helps digital printers streamline their finishing operations. Underpinning the complete Morgana range – which now covers all the main requirements of both digital and conventional printers is a firm commitment to customer care that provides all that is best in service and support. 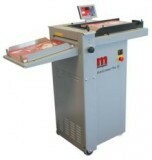 High capacity user friendly range of feeders & collators for digital and offset litho printed applications. Automate sheet feeding with this universal, height adjustable feeder. High Speed Creaser with dual creasing blades and deep pile feeder. Automate print finishing; finish trim, cut, crease and fold! Now you can crease & fold in tandem when you add the AutoFold Pro to your existing creaser! Produce up to 88 page booklets at up to 1800 per hour! Product Booklets Up to 200 Pages Thick! © 2011 - 2019 E. Thomas Brett Business Machines. All rights reserved.